With my work I travel a lot and that means I meet loads of interesting people and learn a whole bunch of new things all the time. Sometimes you hear the same things over and over when you're dealing with the same subject matter. Often it's no problem. All part of the game. Sometimes, however, you hear certain things in loop. Things that you wonder about. One of them is that North American cities are just bigger. On a recent visit to Calgary a couple of weeks ago I must have heard it a dozen times. It's often a (not so) secret code for "we're not really committed to taking the bicycle seriously as transport." As though trying to brush off comparisons with urban cycling in Copenhagen and other Euro-filth concepts. No matter how often I highlight the fact that Copenhagen has the third largest urban sprawl in Europe and most of Copenhagen outside the medieval city centre is a 20th century invention. Nope. "Ain't gonna work here, bubba. Now git off ma lawn." So I opened up Google Earth. Zoomed out to about 60 km. 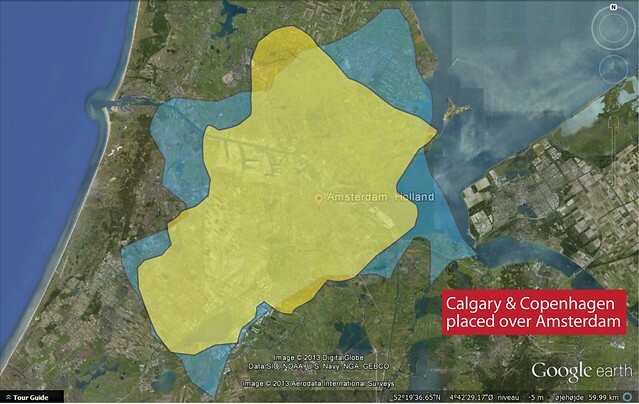 Highlighted Calgary, above, in yellow. 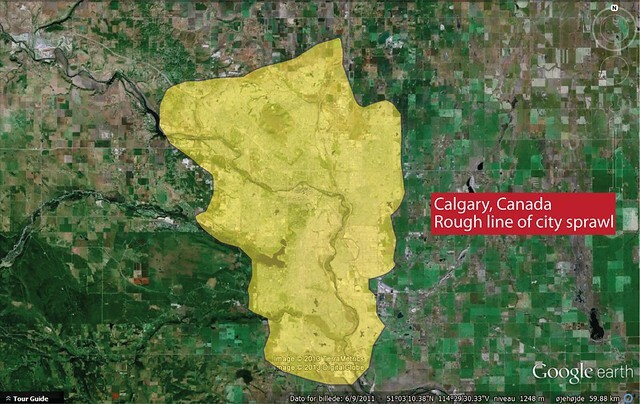 The rough line of the city limits. Very rough... it was late and I was drinking wine. Then I did the same for Copenhagen. The rough line of Greater Copenhagen is in blue. 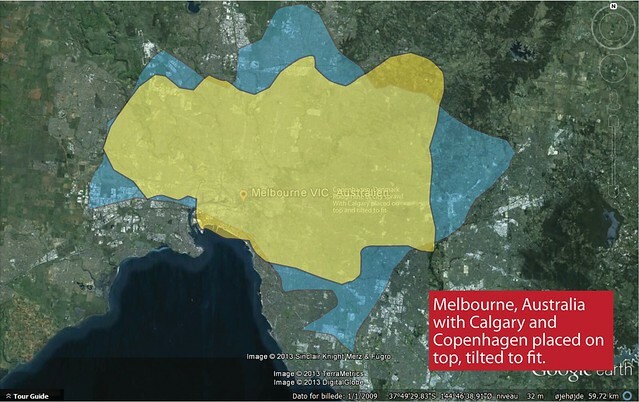 I slapped Calgary onto Copenhagen, tilting it to make it fit nicer, and there you have it. I didn't include the cities in the region that are bedroom cities for Copenhagen or Calgary. Just drew up the rough line around the urban sprawl. 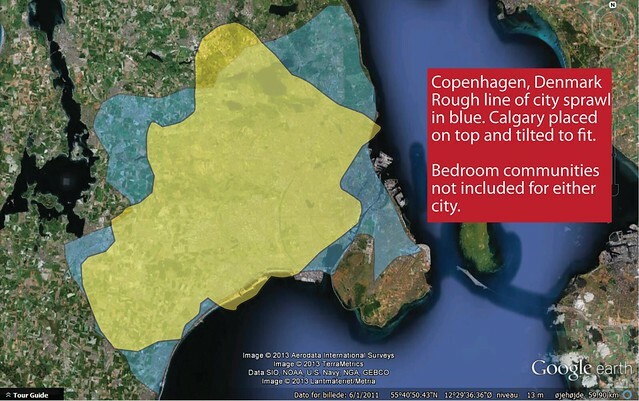 Calgary has about 1 million people and Greater Copenhagen about 1.9 million. Here's both cities slapped onto Melbourne. Their metro area has about 4 million people. So they're bigger. Duh. And here's Amsterdam, with Calgary and Copenhagen laid on top. It was tougher to see what was sprawl and what was farmland on the Amsterdam map, but it's still not far off. So with that aside, I am well and truly tired of hearing about many cities and their perception of size. Time to move on.